Plastic Name Tags and Plastic name badges contribute to corporate branding by adding the business logo to every employee in the company. While name badges and tags are typically restricted to use in the store warehouse or office, they will inevitably get worn to business lunches or even to a gas station on the way home from work. The company name gets advertised to the outside world through the people that have made your business what it is. 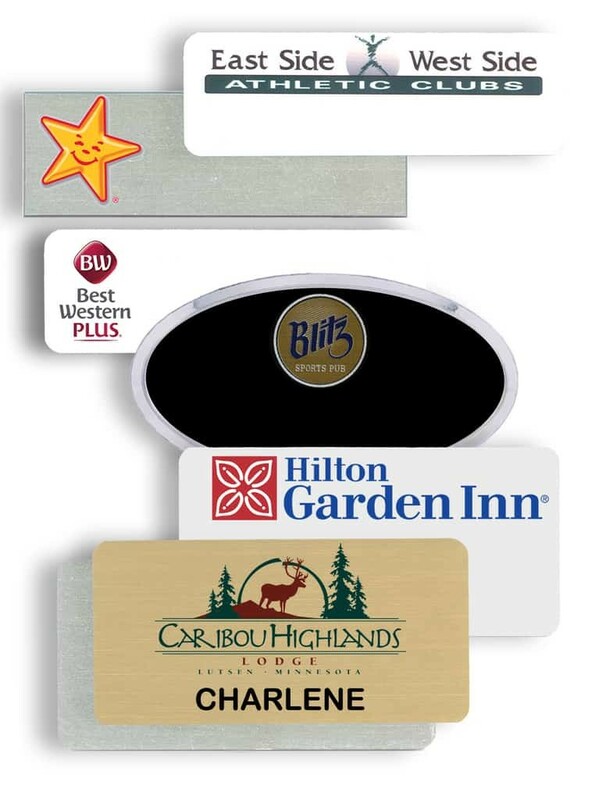 Company name badges and tags can also be used to advertise at special promotions and events. Name-badges.com Inc. has been in the identity business for over 20 years and we are ready to help you design a beautiful and high class name badge. Normally 1 phone call and your logo get the process started, we are in business to make things easy for you. * Pictured Name Badge Frames, Ovals and/or any special cutout shapes are an additional charge.